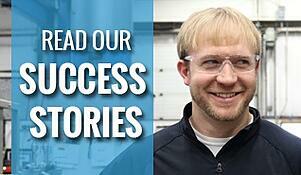 How one paper mill found a solution, applied it, and forgot about it. Is there anything tougher to seal than a bottom entering pulper? Rotors on these machines take a beating from market pulp bales and recycled material, causing large radial shaft deflections. Traditionally, seals have been packed, allowing for leakage, loss of product, wet floors, and thousands of dollars wasted on downtime and gearbox repair. The maintenance department at New Page decided they weren’t going to take it anymore. The leaking seal on “Slab Broke Pulper” was simply costing them too much. They determined that the seal they needed would have to be fast and easy to install, very low maintenance, and withstand the heavy shock and vibration that occurs during normal operating conditions. New Page decided to install a John Crane fully split mechanical seal with compression ring rubber bellows. The rubber bellows would add flexibility and shaft deflection so angular misalignment and run outs were tolerated. The maintenance team at New Page placed bets on the number of days the mechanical seal would survive, confident the harsh operating conditions would cause it to leak. Fast forward 21 years. 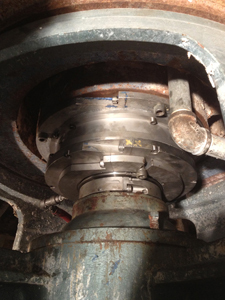 The maintenance team is again looking at “Slab Broke Pulper” to investigate an issue concerning pulp break-up. They inspect the unit and find that the same John Crane seal installed in the early 90s remained, and still, no leaks. Crane Engineering Account Manager Bob Linder, and Service Technician Dave Holtz, along with two of the mill’s maintenance people, rebuilt the seal and promptly put it back into service on “Slab Broke Pulper”. Two years later, and despite a bent shaft, the mechanical seal continues to perform against leakage, saving the mill thousands in rebuilt gearboxes and time spent re-packing stuffing boxes. This video shows the actual mechanical seal in operation.